One of eight bought as a wedding present for foodies! It will be regularly used for ever. 246 customers found this review helpful. Did you? Yes, I did! Really impressed with this product (as with all others we have purchased from Falk) - quality is excellent and we use it regularly - would definitely recommend. 501 customers found this review helpful. Did you? Yes, I did! To my delight, joy and excitement, I was very kindly given my first two (of what I aim to be a growing collection) Falk saucepans as a Christmas present - a saute pan and intermediate saucepan. 516 customers found this review helpful. Did you? Yes, I did! Everyone should have one of these pans - just the most useful thing in the kitchen! 492 customers found this review helpful. Did you? Yes, I did! Great product with even heat distribution and heat control. Highly recommended for any keen cooks out there!. 525 customers found this review helpful. Did you? Yes, I did! I love the fact that you can use this pan in the oven aswell, perfect for a frittata! And since it's so stylish(Signature range) it definitely has its place on the table! 439 customers found this review helpful. Did you? Yes, I did! 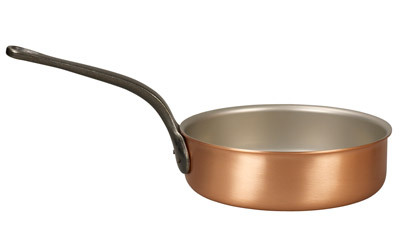 For anyone who loves to cook, this pan is an absolute dream. Impressive heat conduction means that you're left with no hot spots and an even temperature throughout the cooking surface (including the sides). Requires half the gas needed for other pans and the 24cm is a great size when cooking for 2-4 people. Unrelated to the pan itself the service offered by Carol and Neil is second to none. 559 customers found this review helpful. Did you? Yes, I did! The saucepan purchased is really great as are the previous items purchased in the past. 509 customers found this review helpful. Did you? Yes, I did! A pan that feels like it helps you get the results you want! Quality product, a delight to use and pleasure to see the warm glow of copper hanging up in the kitchen. I did worry the first time I used it on the hob with the colour change but rest assured a once over with the scotch barite pad soon brought the lovely glow of the copper back to new. Another addition to my slowly growing range of Falke copper pans. Yet again superbly made and finished to the highest standard. This is a lovely saute pan and has the feel of a very high quality item. There are virtually no hotspots and makes perfect browning a breeze. I would of given five stars except the size measurements do not quite match the website (its over 7cm in height not 6cm as stated) but i prefer this when adding sauces after frying. A small helper handle would be nice though. Overall great to use and so far easy to keep clean and much better and easier to use than my all clad sauté. 686 customers found this review helpful. Did you? Yes, I did! At first I thought the sides might be a bit too high as it's taller than many saute pans I've used, but it's just right. The pan works very well over high heat, and it cleans-up very easily (which is pretty important!). A really well-constructed, high quality pan. Would recommend. 673 customers found this review helpful. Did you? Yes, I did! I waited quite a time before buying but so glad I did. I already owned some poor quality copper pans and was disappointed with one of them. Buying from Falk has made me a happy man (chef). The quality is great and the service excellent. Thank you. Ordered this for my husband's birthday. He's not used it yet so can't comment on that but can say it looks stunning and is very weighty. 480 customers found this review helpful. Did you? Yes, I did! Great product which will last a lifetime. The fast heat transfer of the 24cm saute pan means that it seals tender cuts quickly and also allows a gentle braise. The handle is ergonomically sound and remains cool to the touch. 620 customers found this review helpful. Did you? Yes, I did! Makes cooking a real joy, beautiful to look at, built like a tank. A really versatile pan that has instantly become a favourite - it now lives on our cooker top, that says it all. Before purchasing this I was looking at copper cookware from the 19th Century on Ebay which had been beaten by hand and was 3mm thick and tin lined. 574 customers found this review helpful. Did you? Yes, I did! Ordered 24cm Saute pan on Sunday and was delivered within 48 hours. Exceptionally fast service, item was delivered well packed and in perfect condition. As for the pan its-self It's even better than I imagined & I'm very satisfied with it both in terms of appearance and for the way it performs. In fact IMO it just could not be any better. I had considered buying a Mauviel instead of Falk but I am please with my decision and will certainly purchase more Falk items as funds allow. Chuffed to little mintballs! 538 customers found this review helpful. Did you? Yes, I did! Our son who loves cooking hasn't put it down. 535 customers found this review helpful. Did you? Yes, I did! The 24cm saute pan is a great size for sauteing decent portions of food and is also a manageable weight. The temperature was controlled well, the food was cooked perfectly and it was easy to clean up. Perfect! 598 customers found this review helpful. Did you? Yes, I did! 568 customers found this review helpful. Did you? Yes, I did! This pan is superbly made, it will last a lifetime. It is heavier than many other pans but that is what you want. Heating is even and cooking is very good. Excellent! I admit, I'm new to copper but in my research Falk came highly recommended and the piece did not disappoint! Great customer service.